Great news! The greater glider survey we conducted recently has been verified by ecologists commissioned by the Department of Environment. 100 hectares will be protected from logging! The verification team found the same number of gliders as we did, 15 in total. It's good to see the government respond and act in this case. But why was this logging area not surveyed to start with and why did it take a small group of volunteers to conduct an 11th hour survey to stop logging at the last minute? Hopefully this will encourage Lisa Neville MP's Department to conduct independent pre-logging surveys to ensure protected species are identified prior to logging. There was some great coverage about this successful result on the ABC's AM program. A journalist from the program came out with us on a survey looking for the Greater Gliders smaller cousin, the Yellow Bellied Glider. Skillful in the air, but awkward on land - the greater glider, or clumsy possum as it is otherwise known, is having a big impact on the logging wars in Victoria's East Gippsland. Last week the state's logger, VicForests, agreed to lock up 100 hectares of forest after environmentalists discovered 15 of the gliders. Environmentalists argue VicForests has not done a good enough job at surveying the forests for protected rare and threatened species, so they are conducting their own surveys in other areas. 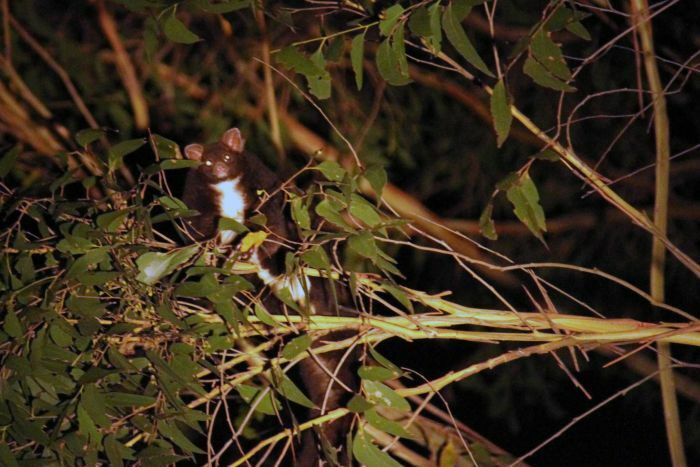 The Goongerah Environment Centre have completed a night search for the clumsy possum's smaller mate, the yellow-bellied glider. In the remote Kuark forest, outside of Orbost, the centre's Ed Hill plays recordings of the powerful owl, a predator of the glider, to see if he could hear the frightened response. "It's been a really successful survey," Mr Hill said. "We've recorded 10 yellow-bellied gliders on our transect, which is fantastic. That's enough to get this area of forest protected." The Goongerah Environment Centre wants to see Victoria's Environment Minister Lisa Neville hand over responsibility for these ecological surveys to an independent body,not VicForests. They argue the logging body simply is not doing a good enough job. Ms Neville said in a statement: "The Government is disappointed to see that rare and threatened species may have been impacted by the harvesting operations in question, if this community generated information had not been made available. "We are currently working to ensure that in the future we are guided by the best available data, which will help improve decision making." VicForests communications manager David Walsh said the logger would also be changing how it surveyed forests. "VicForests wouldn't have found them [the animals] ourselves in that particular site, and as a result of that type of occurrence and information coming to us, we're now reviewing our overall approach to targeted pre-harvest fauna surveys for species like greater gliders," he said. He said his organisation would consider any information it was given about the yellow-bellied glider. Sort of sadfunny,“not a good enough job”,understatement. Sack and charge Vic Forest pillage organization,3 strikes your out.